Health snippets - Culinary delights. This issue will be very brief and as some of you may have realised, its already a little later in its delivery than usual. This is all due to the fact that we have both been away from the clinic lately - as some of you will be aware, Susannes Mum passed away recently and with this type of event there are many things that need to "be sorted". Thankfully we are almost there, but what I have learn't out of this is that if you can't take it with you don't worry about it. It seems we are all guilty of accumulating all types of "stuff" and once we leave this realm what use is it to us - or anyone for that matter. Enjoy your things while you can, use the good glasses and expensive crockery, don't worry if something gets a wee scratch on it and most of all show gratitude for what and who you have around you. I had planned to write a little about hypertension this month - hence the title, but that will have to come sometime soon. So what is it that is going up? It hasn't happened for a couple of years but we know it is a fact of life, so effective 1 October 2009, prices on all ONEgroup products will increase by an average of 3.5%. As an Australian enterprise, ONEgroup sources ingredients for their products across five continents of the world. In many of these areas prices have skyrocketed as fuel cost and fair trade labour policies – a good thing – have increased. Innovative business practices and automation have enabled ONEgroup to avoid a price rise for nearly two years but now global conditions require an adjustment. Your commitment in suppporting the organic and natural lifestyle industry through our ONEgroup products is something that we greatly value. We sincerely appreciate your understanding and continued support as we work to provide you with the world's finest organic products, anywhere! So with this in mind, whether it is through the products listed on www.tauponatural.com or directly through our affiliated website www.thebecks.mionegroup.com it doesn't matter, but of course now is the time to get in and place an order for one of those great organic products you know you want - you have until the end of the month to get in before the prices go up. Certified Organic Aromas can put you in a good mood everyday! A whole new area of healing and feeling good is now available with the introduction of Miessence Certified Organic Essential oils. You may know some of the properties of essential oils, and you may even use some of them, now you have access to a complete range of the PUREST most POTENT Essential Oils available. We know you will find nothing better. Here is an insight into these four sweet, sprightly citrus essences to refresh and uplift the spirit. so sunny & soothing it can actually lower the blood pressure! Discover how to enhance your moods and create feelgood atmospheres at home at work - even in your car. 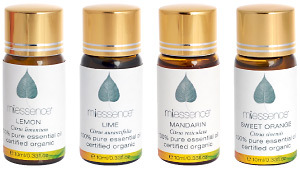 Use miessence pure, certified organic oils in a bath, a diffuser or inhale the fragrance from a tissue. And you'll never have to suffer 'Monday-itis' again! These four citrus oils - lemon, lime, sweet orange and mandarin are among 25 of the purest, internationally certified essential oils available on the planet. They can be obtained now from our ONEgroup website - either singularly or as part of a boxed collection. Culinary herbs as biological insecticide? Its not really anything new to those of us in the know - herbs are amazing medicines - but in a new study, scientists have determined that spices like rosemary, thyme, clove, and mint can provide eco-friendly pesticides for organic fruits and vegetables. As the industry tries to satisfy demands for fruits and veggies free of toxic residues, well-known spices are now becoming organic agriculture’s key weapons against insect pests. Do you know what plastics to avoid? Here is some information relating to plastics - inparticular, those plastics we should be avoiding. Just imagine that in the future(and its not too far away) we will have products in "safe" and biodegradable plastics. This is something ONEgroup is also working on, it is going to happen so watch this space. We really would like more of you to feel the benefits of using the purest products on the planet, so for all those who go ahead and order the "Skin Essentials" pack of Miessence products(thats a cleanser/skin conditioner and moisturiser - 3 products with a 10% discounted pack price) from our website before the end of the month we will send you a free gift once your order has been confirmed. Just email us your order/invoice number and we will send you your free gift(it will be well worth your effort:)). This offer will only be available until the end of September. If you would like to take advantage of this months offer please Click here without delay.